Summary of outcomes: The Committee considered 10 specific submissions, general issues of implementation and compliance, and its draft 2020-2021 work programme. With respect to the specific submissions, 9 Parties attended the meeting and the Committee adopted 6 decisions whereby it concluded that the matter of concern had been resolved. This concerned submissions regarding Cabo Verde, Eritrea, Guinea Bissau, Libya, Oman and Turkmenistan. In its decision pertaining to the self-submission by Central African Republic, the Committee approved this Party’s compliance action plan and recommended that the Executive Secretary use resources in the implementation fund of up to USD 20’000.- to fund activities listed in the plan. With respect to the extended Secretariat trigger, the Committee recommended to the Conference of the Parties that it not confirm the extension of the Secretariat’s trigger pertaining to national definitions of hazardous wastes, import/exports restrictions and prohibitions, and updated information with respect to country contacts, national definitions of hazardous wastes, import/exports restrictions and prohibitions. Under its general review mandate, the Committee, among other things, reviewed the classification of Parties’ compliance performance with national reporting for 2014 and 2015, review a benchmark national report and developed a set of recommendations on how to improve the timeliness and completeness of reporting for the consideration of the fourteenth meeting of the Conference of the Parties. The Committee also continued its consideration of four draft guidance documents that were consulted with OEWG-11, namely the guide on the development of legal frameworks, guidance on improving national reporting, guidance on insurance, bond and guarantee and guidance on transit transboundary movements. With respect to the development of legal frameworks and preventing and combating illegal traffic, the Committee also developed a set of recommendations on how to improve implementation for the consideration of the fourteenth meeting of the Conference of the Parties. Finally, the Committee considered a report on the review of the operation of the implementation fund, including links with the Secretariat’s technical assistance plan (document UNEP/CHW.13/INF/36), notably in relation to access to technical and financial support. The Committee also prepared its draft 2020-2021 work programme which was consulted with Parties in advance of the fourteenth meeting of the Conference of the Parties. On Monday 10 September, the Committee suspended its thirteenth meeting. The meeting was resumed through a supplementary online session on 30 October 2018. At that time, the Committee continued its consideration of five specific submissions regarding Bhutan, Eritrea, Liberia, Oman and Togo. The Committee also finalized the guide on the development of legal frameworks, the guidance on improving national reporting, the benchmark national report and the guidance on insurance, bond and guarantee. All four guidance documents will be made available for consideration and possible adoption to the fourteenth meeting of the Conference of the Parties. The face-to-face meeting of the Committee took place back-to-back to the eleventh meeting of the Open-ended Working Group and was chaired by Mr. Juan Simonelli (Argentina). The Government of Switzerland provided generous financial support to enable the participation of representatives concerned by a submission to participate in the meeting. During its thirteenth meeting, the Committee invited Parties and others to provide comments, please visit the "Call for information and follow-up to ICC-13" page. 1. By its decision BC-13/9, the Conference of the Parties at its thirteenth meeting adopted the work programme for the biennium 20182019 of the Committee, attached to that decision, whereby it mandated the Committee, among other things, to prepare a report on its evaluation of the effectiveness of the amendment to paragraph 9 (c) of the terms of reference of the mechanism for promoting implementation and compliance adopted by decision BC-10/11, and further extended by decisions BC-11/8 and BC-12/7, including recommendations, for the consideration of the Conference of the Parties at its fourteenth meeting. 1. As referred in document UNEP/CHW/CC.13/4, the draft classifications of Parties’ compliance performance with their national reporting obligation for 2014 and 2015 are set out, respectively, in annexes I and II to this note. As referred in document UNEP/CHW/CC.13/4, a draft benchmark report aimed at facilitating reporting under paragraph 3 of Article 13 of the Basel Convention as of the reporting year 2016 is set out in the annex to the present note, for the consideration of the Committee. The Committee may wish to request the Secretariat, under the guidance of the lead members, to finalize the benchmark report in light of the discussions held during its thirteenth meeting for the consideration of the Conference of the Parties at its fourteenth meeting. As referred to in document UNEP/CHW/CC.13/4, the draft revised guidance on improving national reporting, taking into account the revised reporting format to be used for 2016 and onwards is set out in the annex to this note, for the consideration of the Committee. The Committee may wish to request the Secretariat, under the guidance of the lead members, to finalize the guidance in light of the discussions held during its thirteenth meeting and taking into account the outcome of the consultations with the Open-ended Working Group at its eleventh meeting for the consideration and possible adoption by the Conference of the Parties at its fourteenth meeting. As referred in document UNEP/CHW/CC.13/4, a draft report on the status of reporting and how to improve the timeliness and completeness of reporting is set out in the annex to the present note, for the consideration of the Committee. The Committee may wish to request the Secretariat, under the guidance of the lead members, to finalize the report in light of the discussions held during its thirteenth meeting for the consideration by the Conference of the Parties at its fourteenth meeting and to develop recommendations for improving the timeliness and completeness of national reporting for the consideration and possible adoption by the Conference of the Parties at its fourteenth meeting. 1. By its decision BC-13/9, the Conference of the Parties at its thirteenth meeting adopted the work programme for the biennium 20182019 of the Committee administering the mechanism for promoting implementation and compliance, attached to that decision, whereby it mandated the Committee, among other things, to consider what additional steps could be taken to improve implementation of and compliance with Article 9 of the Convention on preventing and combating illegal traffic. (e)	Monitor activities undertaken by or with the support of the Basel Convention regional and coordinating centres (BCRCs/BCCCs), the United Nations Environment Programme (UNEP) and other entities aimed at assisting Parties to develop legal frameworks for the implementation of the Basel Convention. 2. By its decision BC-13/9, the Conference of the Parties also invited Parties to submit comments on the above mentioned guide for the development of national legal frameworks to implement the Basel Convention to the Secretariat by 30 September 2017 for consideration by the Committee. As referred in document UNEP/CHW/CC.13/6, a draft guide for the development of national legal frameworks to implement the Basel Convention is set out in the annex to the present note, for the consideration of the Committee. 1. By its decision BC-13/9, the Conference of the Parties at its thirteenth meeting adopted the work programme for the biennium 20182019 of the Committee administering the mechanism for promoting implementation and compliance, annexed to that decision, whereby it mandated the Committee, among other things, to undertake activities with the objective of improving the implementation of and compliance with paragraph 11 of Article 6 of the Convention, as follows: finalize, including through consultation with the Open ended Working Group, the guidance to improve the implementation of paragraph 11 of Article 6 of the Convention2 for consideration and possible adoption by the Conference of the Parties at its fourteenth meeting. 1. By its decision BC-13/9, the Conference of the Parties at its thirteenth meeting adopted the work programme for the biennium 20182019 of the Committee administering the mechanism for promoting implementation and compliance, annexed to that decision, whereby it mandated the Committee, among other things, to undertake an activity with the objective of improving the implementation of and compliance with Article 6 of the Convention, as follows: develop, taking into account the report on the implementation of and compliance with paragraph 4 of Article 6 of the Basel Convention on transit transboundary movements, in particular its paragraphs 81–83, guidance on the implementation of paragraph 4 of Article 6 of the Convention for consideration and possible adoption by the Conference of the Parties at its fourteenth meeting. 1. By its decision BC-13/9, the Conference of the Parties at its thirteenth meeting adopted the work programme for the biennium 20182019 of the Committee administering the mechanism for promoting implementation and compliance, annexed to that decision, whereby it mandated the Committee, among other things, to review the operation of the implementation fund, including the links with the Secretariat’s technical assistance plan (document UNEP/CHW.13/INF/36), notably in relation to access to technical and financial support. 1. In accordance with paragraph 24 of the terms of reference of the mechanism for promoting implementation and compliance of the Basel Convention, the Committee administering the mechanism (hereinafter “the Committee”) shall report to each ordinary meeting of the Conference of the Parties on its suggestions for any future work that may be required on general issues of compliance and implementation, for the consideration and approval of the Conference of the Parties. It is standing practice by the Committee to also include in its proposed work programme activities pertaining to specific submissions. 1. 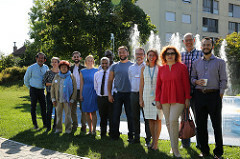 The thirteenth meeting of the Committee Administering the Mechanism for Promoting Implementation and Compliance (‘the Committee’) was held from 7 to 10 September 2018 at the International Environment House II, Geneva, Switzerland. Mr. Juan Ignacio Simonelli, Chair of the Committee, opened the meeting at 2.00 p.m. He welcomed Committee members and observers, on behalf of the Committee, expressed his appreciation to the Government of Switzerland that provided funding for the meeting. Mr. Simonelli also thanked those Committee members that were making in-kind contributions to the Committee by taking the lead on specific activities of the work programme of the Committee. 1. As referred to in document UNEP/CHW/CC.13/11 on the report of the thirteenth meeting of the Basel Convention Implementation and Compliance Committee (Geneva, 7-10 September 2018), the present addendum completes the report of the meeting with respect to the Committee’s consideration of agenda items 3 (a) (i), (iv), (vi), (viii) and (ix), 3 (b), 4 (a) (iii), 4 (a) (v), 4 (f) (ii) and 5. 2. With respect to agenda items 3 (a) (i), (iv), (vi), (viii) and (ix), representatives of the following Parties concerned by a submission attended the session: Bhutan, Eritrea, Liberia and Togo. The following additional or revised documents were available during the session, reflecting developments since 10 September 2018: UNEP/CHW/CC.13/INF/2/Rev.1, UNEP/CHW/CC.13/INF/5/Rev.1, UNEP/CHW/CC.13/2/Add.6/Rev.1 and UNEP/CHW/CC.13/INF/14, and UNEP/CHW/CC.13/INF/8/Rev.1. The five decisions adopted by the Committee are set out in the annex to the present note. As referred to in document UNEP/CHW/CC.13/1/Add.1, the annex to the present note contains a tentative schedule for the work of the Committee Administering the Mechanism for Promoting Implementation and Compliance at its thirteenth meeting. It is intended to assist members of the Committee in planning their work during the meeting. The present note, including its annex, has not been formally edited. As referred to in the note by the Secretariat on illegal traffic (UNEP/CHW/CC.13/5), the annex to the present note contains a report on additional steps that could be taken to improve implementation of and compliance with Article 9 of the Convention. The present note, including its annex, has not been formally edited. As referred to in the note by the Secretariat on national legislation (UNEP/CHW/CC.13/6), the annex to the present note contains a synthesis of the responses received as well as recommendations for the consideration of the Committee based on the monitoring of activities undertaken by or with the support of the BCRCs/BCCCs, UNEP and other entities aimed at assisting Parties to develop legal frameworks for the implementation of the Basel Convention. The present note, including its annex, has not been formally edited. By its decision 13/2 on follow-up to the Indonesian-Swiss country-led initiative to improve the effectiveness of the Basel Convention, the Conference of the Parties adopted the work programme of the expert working group on environmentally sound management set out in the annex to that decision and requested the expert working group to implement it, subject to the availability of resources. 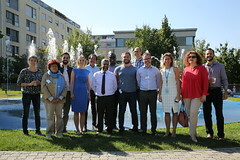 Further, the Conference of the Parties requested that draft documents developed by the expert working group be submitted for comment to Parties and other stakeholders and for consultation, where appropriate, with the Open-ended Working Group and the Implementation and Compliance Committee before being submitted to the Conference of the Parties for adoption.